Mexico is a Spanish speaking country in North America, lying between the United States of America to the north, and Guatemala and Belize to the southeast. 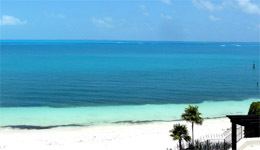 Its extensive coastlines include the Gulf of Mexico and the Caribbean Sea to the east and the Pacific Ocean to the west. Mexico is one of the most popular tourist countries on earth and much of the tourist industry is centered around the beach resorts as well as the altiplano in the central part of the country.